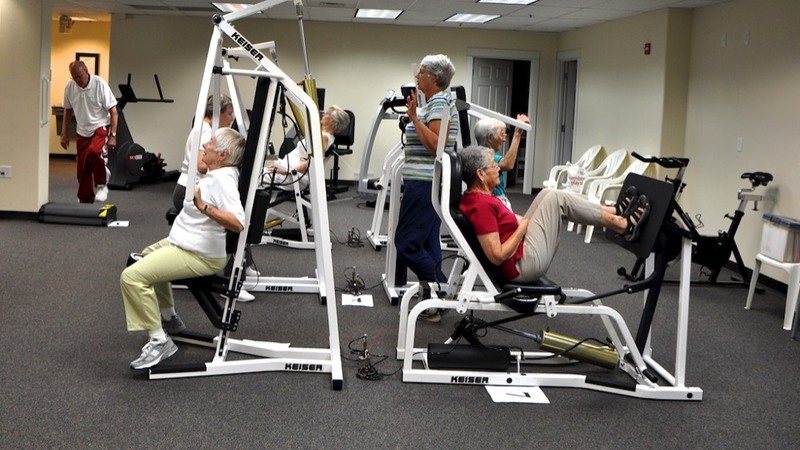 The fitness program at Mountain Meadows is designed to maintain and improve the physical fitness of residents. Fitness facilities include a Fitness Center with free weight, six pneumatically controlled resistance machines, swimming pool and a hot tub, treadmills, upright and recumbent bikes, standing and recumbent elliptical machines, sitting and standing arm machines, and rowing machines. A trainer is retained to assist residents in the use of equipment and to develop individually tailored fitness routines. Fitness classes, facilitated by the trainer and outside specialists, are held in the Clubhouse and in the swimming pool. Current classes include Floor Stretch, Tai Chi, Yoga, Low impact Aerobics, Chair Osteo, Brain and Body Challange, Aquatic Fitness, Water Movement, and Meditation. There are 35 class sessions per week. Come, enjoy the fun and get fit! Heart Smart - 8:00 AM, Tuesday & Thursday in the Fitness Center This class provides a more vigorous, quick-paced workout oriented towards cardio-vascular fitness and strength building. It is adapted from the HIIT (High Intensity Interval Training) program. After a five minute warmup on a cardiovascular exercise machine (treadmill, rowing machine, elliptical trainer, or exercise bicycle), participants are guided in three or four intervals timed for 30 or 40 seconds. The next 18 – 20 minutes focus on strengthening exercise using the Keiser machines, free weights, exercise balls, elastic straps, standing exercises such as squats and lunges, and sometimes combinations of two or three forms. The participants next switch back to a cardiovascular machine they have not yet used, for the final three to five intervals. The class concludes with a cool down and stretches standing or lying down. In all the exercises participants work at the level of intensity appropriate to their own capability. The class is small, typically with three to five participants. Joyful Joints - 9:30 AM, Monday, Wednesday, & Friday in the Rogue Room This class is great for anyone who wants to get started moving more, loosening up stiff joints and improving flexibility while reducing joint pain. Exercises are primarily done sitting in chairs. The class works with every joint from one’s neck to one’s toes, using gentle, controlled movements. Carol Lee tailors the movements for each person. The class is small, averaging 4 to 6 people. It is a good place to meet new residents. People check in and share their experiences as part of the class. Brain & Body Challenge - 9:30 AM, Tuesday & Thursday in the Rogue Room This class is focused on improving concentration and the interactions between one’s brain and one’s body, particularly speeding up reaction time and ability to multi-task. The exercise is done sitting in chairs set in a circle. People in the class toss and catch small air-filled balls, first with themselves and then with a partner across the circle. To increase the challenge, people move their feet while passing the balls. Then Carol Lee has people call out names (e.g., colors, fruits, etc.) as the balls are passed. Then the balls are bounced off the floor to the partner. This exercise improves all aspects of hand and eye coordination. The class is small, typically with 3 to 8 people. It is stimulating, invigorating, fun, and a great way to get the day started. Osteo Chair - 10:00 AM, Monday through Friday in the Rogue Room This exercise class is designed for building strength and balance. It is a vital aid for people who are aging, to help them stay independent. Both sitting and standing exercises are performed, using elastic straps, free weights, and isometric exercises. The exercises strengthen the legs, the arms, the upper body, and particularly the core. Stretches are also emphasized, along with various exercises to improve balance. Leg movements include squats, chair raises, and forward and side lunges. Upper body movements include a variety of shoulder, chest, back, and abdominal exercises. Exercises are tailored to accommodate individual limitations (e.g., people’s knee, hip, and shoulder problems). Chair Osteo typically has from 13 to 20 people, and is a wonderful class for new residents. Residents tell jokes as an integral part of the class, and there is lots of laughter. The mental challenge of remembering one’s jokes is an added bonus! Floor Stretch - 10:30 AM, Monday, Tuesday, Wednesday, & Friday in the Rogue Room This class is geared for anyone who experiences body tightness, stiffness, or restricted motion. It uses a variety of gentle, easy stretches derived from yoga. Stretches are performed sitting, standing, kneeling and lying on the floor both face down and face up. Mats are provided. Exercise balls, cloth yoga straps, yoga blocks, and foam rollers may be used to help with the stretches. The stretches accommodate individuals’ limitations. Meditation - 10:30 AM, Thursday in the Rogue Room This class is based on mindfulness meditation to increase awareness of both one’s mind and one’s body as experienced in the present moment. It is an opportunity to calm and center, to stop the busyness for a while and take time just for oneself. The class helps one pay attention to one’s breathing, posture, tensions, body feelings, and all of one’s senses, as well as the thoughts that pass through one’s mind while in a place of stillness. There is a topic focus for every class. The class has 20 minutes of guided silent meditation, a reading, and an open discussion. The size of the class averages 13 participants. Zumba Gold ($5 fee) - 8:30 AM, Monday, Wednesday, & Friday in the Rogue Room Zumba is a Latin dance-inspired aerobic workout that builds cardiovascular health by challenging the heart and working the muscles of the hips, legs and arms with choreographed dance moves set to Latin music. Zumba Gold modifies the standard Zumba routines to be more appropriate for seniors, with lower impact and reduced speed. Zumba Gold incorporates a medley of dance styles, including merengue, cha-cha, cumbia, belly dance, rumba, tango and salsa. Chair-based options are also available to participants in Zumba Gold. Zumba Gold is great for increasing endurance, improving coordination, and burning calories for weight control. Participants wear loose-fitting comfortable clothes that allow free movement and shoes, preferably without tread, such as dance sneakers, that protect one’s knees and ankles during pivots and turns involved in the dance moves. Water Movement ($5 fee) - 10:45 AM, Monday & Friday in the Fitness Center Pool This class provides a total workout in our 88°F pool, with exercises for strength, endurance, and cardio fitness, along with stretch and dance movements. The water provides buoyant support, so larger movements can be made without worrying about falling. The water also provides resistance for improving strength and endurance. Muscles feel relaxed after working in the warm water, rather than tight as commonly experienced after exercising on land. Joints don’t hurt; one’s whole body tends to feel better. Water movement is great for rehabilitation, after damage to knees and other joints. People who have improved their strength in water movement exercise have faster recovery after knee and hip replacements. Kathleen emphasizes awareness and attention in using the brain to control the muscles, concentrating on working from one’s center out and focusing on balance. Water movement trains a variety of skills for use on land. The exercises translate to better posture, and better balance in everyday life. The hour-long session includes a warm-up, a set of movement exercises which vary from class to class, and a cool-down period. Some of the exercises use foam shapes, water paddles, and water weights, with progressively-increased resistance as one gets stronger. Kathleen tailors the exercises to where each person is. She incorporates aspects of a number of different movement disciplines she has studied, including T’ai chi, modern dance, martial arts, and Pilates. The class is small, with a maximum of 10 people. Participants have a lot of fun, and there is a real camaraderie in the group. New people are encouraged to come and try it out. Yoga ($5 fee) - 9:15 AM, Tuesday & Saturday in 905 Pavilion This class provides a variety of stretching and strengthening exercises based on hatha yoga. The poses are particularly chosen to be appropriate for seniors. The class is suitable for people with a range of abilities in terms of flexibility and strength, as well as different amounts of prior experience with yoga, including beginners. It is great for improving body attention/body awareness, postural alignment, and balance. The class begins with neck and shoulder stretches, followed by standing poses such as side stretches and knee bends with feet wide apart. Next are poses with hands and knees on the floor, such as the plank and downward facing dog poses. Following are poses to strengthen the back, such as the cobra pose and the bridge pose. Hip and leg stretches are next, performed sitting or lying on one’s back. Last are reclining twist stretches, followed by 10 minutes of relaxation and breathing exercises. Marion addresses limitations such as joint problems on an individual basis; however, participants do need to be able to get down and up from the floor. People wear loose, flexible clothing and bring their own yoga mat, a small pillow, and a blanket or towel. Shoes are off, and it is helpful in some of the poses for one’s feet to be bare. The class is small to facilitate individual instruction, typically with 8 to a dozen people. Instructional CDs are available that Marion developed to help with practice outside of class. 11:00 AM, Advanced class, Tuesdays in the Rogue Room 11:30 AM, Beginning class, Thursday in the Rogue Room Strength, balance, body awareness are the goals. The Wednesday class teaches a simplified beginners’ form of T’ai Chi, combined with Qigong (“chi kung”) exercises. T’ai Chi is derived from ancient Chinese martial arts training practices, working with chi, often described as “life force energy”. T’ai Chi involves slow, controlled, graceful movements of the whole body between a set of postures in a manner that trains balance, posture, body awareness, and coordination. A form of moving meditation, T’ai Chi is a superb way of improving the connection of the mind and the body. Qigong exercises facilitate the flow of the chi energy through the body, enhancing flexibility and loosening tight areas of the body. The class typically has eight to twelve participants. It is suitable for people who have had no prior experience with T’ai Chi. The beginners’ class works with eight of the T’ai Chi forms. Lilibet has a video DVD available to help in practice outside the class. On Friday, a more advanced program is offered.